Diamondbacks starting pitcher Chase Anderson and outfielder David Peralta have both shined as midseason roster additions. MLB.com has cited Peralta as a worthy Rookie of the Year candidate. 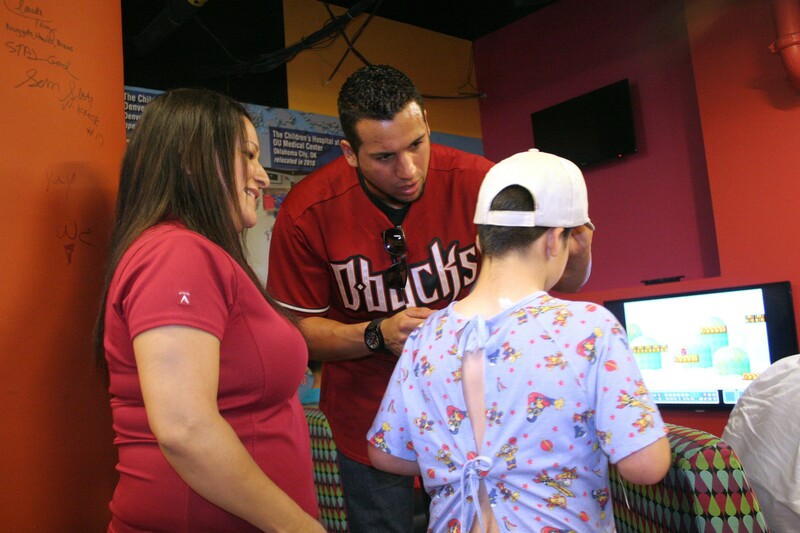 Both talked about their seasons Tuesday after visiting Phoenix Children’s Hospital. Since his promotion from Double-A Mobile in June, Peralta has impressed again and again in the outfield and at the plate. As of Monday, he was batting .287 with a .781 on-base plus slugging percentage (OPS) after hitting .327 in his first 37 games. Peralta said it’s humbling to be mentioned as a possible Rookie of the Year but that consistency is his primary goal. “I played two-and-a-half years of independent ball and nobody knew about me,” Peralta said. Anderson, 7-6 as of Monday, started the season in Double-A Mobile and turned heads by winning his first five starts after being called up in May. Drafted by the Diamondbacks in 2009, Anderson said getting the opportunity to play has been fulfilling. Anderson said he was humbled to reach the majors, let alone enjoy success. Rookie outfielder David Peralta, visiting Phoenix Children's Hospital on Tuesday, has been a bright spot in an otherwise forgettable season for the Arizona Diamondbacks. Pitcher Chase Anderson won his first five starts as a Diamondback and through Monday had a 7-6 record and 3.90 ERA.